Discount Zooka AL-1 Autoloader Ball Feeder - Free Shipping! 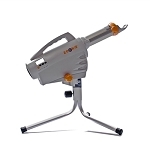 Made specifically for the Zooka ZS720 and Zooka ZS740 pitching machines, the Zooka AL-1 Autoloader feeds balls into the pitching machine so that you can practice hitting or fielding all by yourself. Capable of holding up to 16 baseballs or 18 tennis balls, the Zooka AL-1 Autoloader ball feeder releases a ball every 7 seconds. You can hit pit after pitch and field ground balls or fly balls for nearly two straight minutes before needing to resupply the feeder with balls. 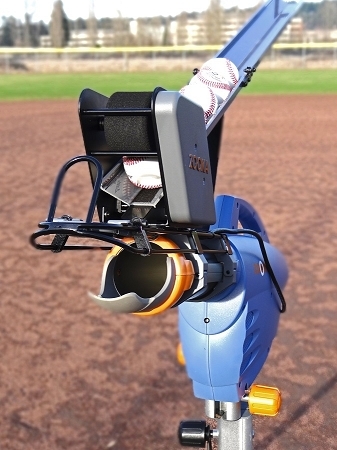 No need for an additional power supply, the Zooka AL-1 feeder gets its power directly from the pitching machine. It also features the same 30 Day Satisfaction Guarantee as all other Zooka products. Q: How fast does it pitch ? A: The Zooka Autoloader releases a ball approximately every 7 seconds. Q: How many miles per hour pitch range and types pf pitches does it throw? 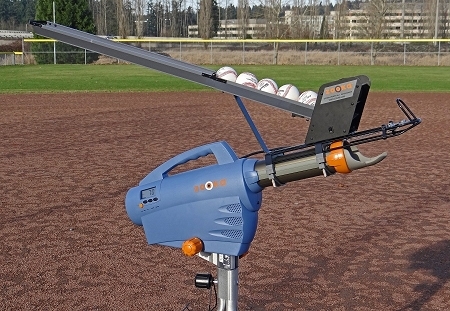 A: The autofeeder does not pitch at all; it simply feeds balls into one of Zooka's pitching machines. Both Zooka machines only throw fastballs or changeups; no curves. 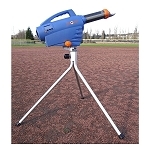 You can view the individual speeds and features of the Zooka pitching machines by clicking on the Zooka brands link in the left navigation sidebar and then clicking on the ZS720 pitching machine or the ZS740 pitching machine. We will be happy to refund the full purchase price of the product but customers are responsible for the return shipping costs to Zooka as well as our original actual shipping costs, whether they obtained "free" shipping or not. Because unprotected automatic ball feeders are frequently left unprotected and can be severely damaged by a batted ball, there is no warranty offered on this product other than it being defective upon arrival. No matter where you order a Zooka AL-1 Autoloader from, NOBODY actually stocks them; they all ship directly from the manufacturer's warehouse located in Redmond, Washington. Therefore, the shipping time frame is exactly the same no matter what website you order from (we hope that it is this one!). Zooka AL-1 Autoloaders typically take 2-4 business days to ship from the time you place your order. They ship via FedEx Ground and could take anywhere from a day or two to a week to get to you AFTER being shipped, depending on your proximity to their warehouse. We will notify you of your tracking number the moment we receive it from the manufacturer's warehouse. Click here to download an easy to read, printable PDF of the Zooka AL-1 Owner's Manual.